If you want to make sure your garden has pollinators, you might want to try beekeeping, as we discussed in a previous post. Today we peek inside to see how a bee hive is constructed. 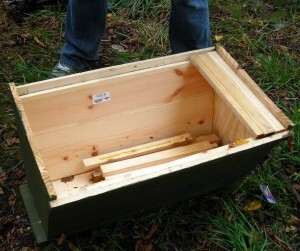 Building a hive would be a good winter project, or you can purchase a hive. Philip Barr, who presented a workshop on beekeeping for Buffalo ReUse, builds what are called Langstroth hives, seen below right. The hive is named for its inventor, the Rev. Lorenzo Lorraine Langstroth. 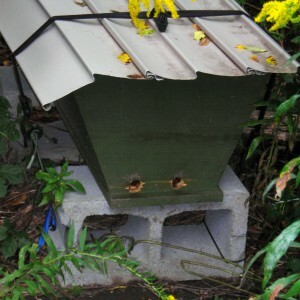 This particular style is a Kenya top-bar hive, which has bars along the top, as seen below left. 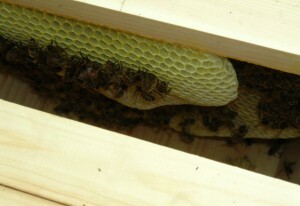 The bars resting inside the hive in the photo are arranged to cover the top. With previous designs, such as a straw, cone-shaped skep (the kind you see in cartoons), the honeycombs filled the interior of the hive, and the hive was destroyed in order to get at the honey. Langstroth figured out a way to build a hive to make it easy for the beekeeper to be able to lift out an individual honeycomb to check for pests or to harvest honey without disturbing the entire hive. Langstroth observed that if a space is more than 3/8 inch across, bees will build honeycomb, Barr explained. If a space is less than 3/8 inch across, bees will cement it with sticky stuff called propolis. Therefore, it’s easy to get the bees to attach honeycombs only where you want them– along the bars at the top of the hive– by cutting the bars to the proper width. A bar of any width larger than 3/8 inch will work, and 1 1/2 inches works well, Barr said. Putting a strip of beeswax down the center gives the bees a starting point, as if someone had started their work for them. Barr shows the beeswax line in the photo at right. The bees will cement the spaces in between the slats with propolis. 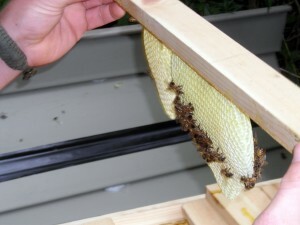 When the beekeeper wants to lift out a comb, he or she can gently loosen the propolis to unstick the bars, as seen in the photo below left. This hive is 17 inches long and 11 1/4 inches high. The holes that allow the bees to enter and exit are about an inch in diameter. Barr estimates you can build a hive for $85 using new wood, or you can use scrap wood. (You can get used wood at Buffalo ReUse.) You can paint the outside of the hive, but he suggests using latex paint rather than oil. Don’t paint the inside. Barr set a scrap piece of awning material on top of the hive and tied it down to help protect the hive from the elements, which you can notice in the photo at top right. In the winter, he may put a couple of bales of hay on each side to help insulate the hive. You want to orient the hive away from the wind in winter, and Barr said he may place a cork in one of the exit holes to help keep wind out. You want the hive at a convenient height, and you can use cinder blocks to lift the hive off the ground, he suggested. The hives can also be stacked. 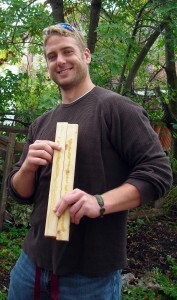 Barr is available to answer beekeeping questions, and he makes hives. 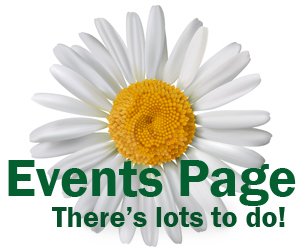 You may contact him at philip@ohanamalu.org. Blessed is he who’s found his work; let him ask no other blessedness. 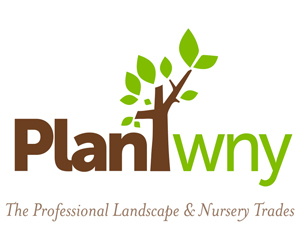 Failure or success running a business is caused more from the mental attitude even when compared with mental capacities.